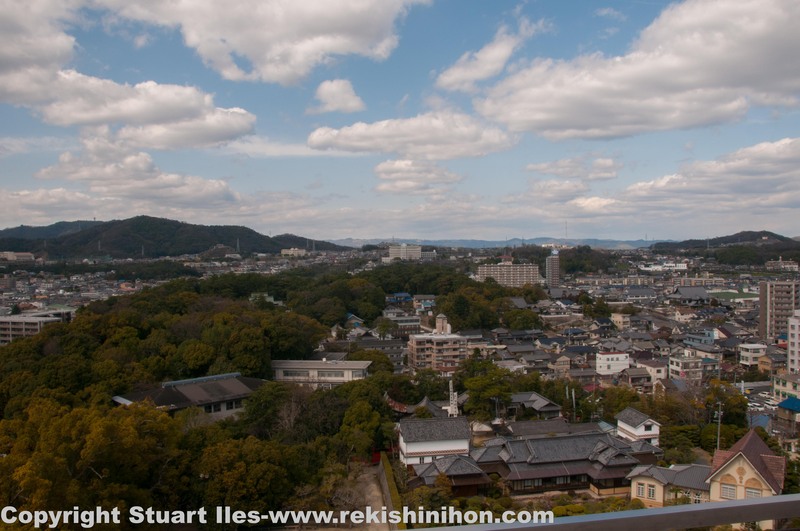 My first visit to Fukuyama and it turned out to be a beautiful day. After doing my immigration paperwork I went to the castle. Fukuyama castle is beautiful on the eye. As with most castles it was also bombed during the war, which is a sad pattern I’m finding for each place I go to. But on a positive note, two outer facilities escaped intact and can be seen as they were in their original location and architecture and the restoration work that has been done is good. 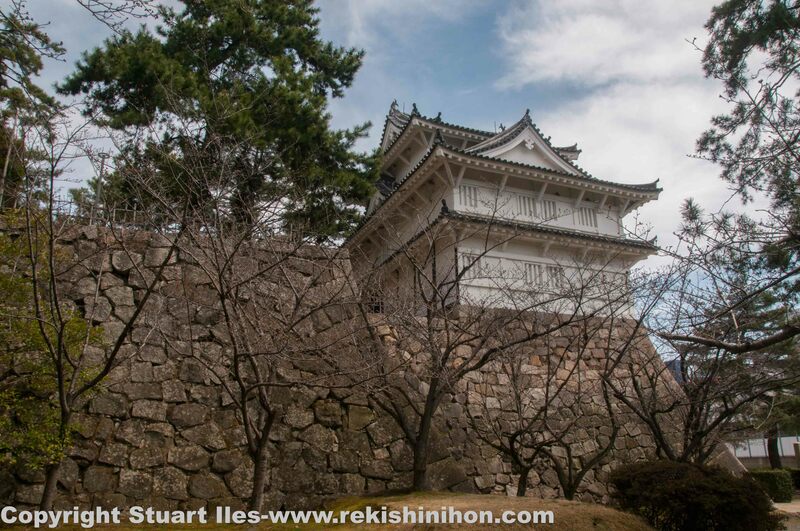 Lord Mizuno Katsunari, who was a cousin of Tokugawa Ieyasu, build this castle complex in 1622. 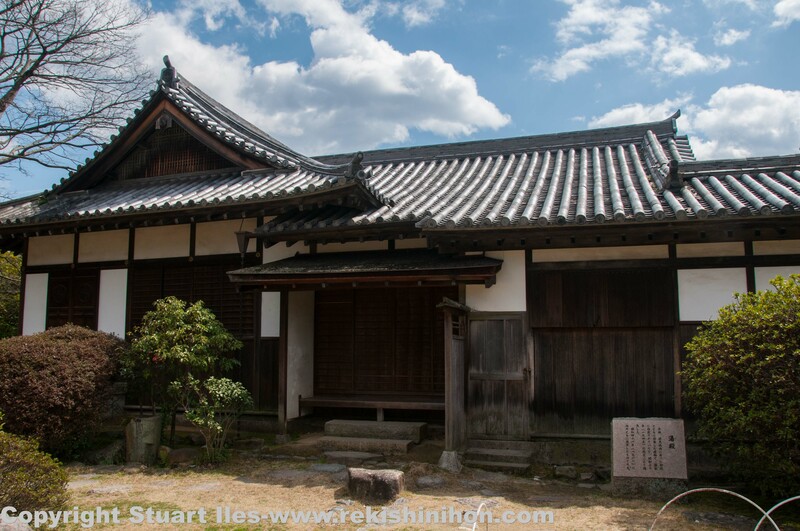 Some buildings were brought in from Fushimi castle in Kyoto in their haste to establish the Tokugawa shogunate authority in the region. It took only 3 years to build. 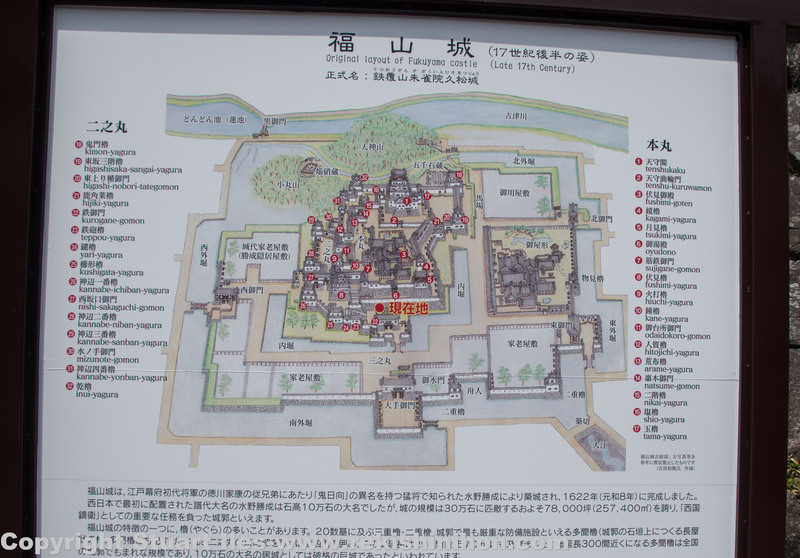 The original complex was 37ha in size, had double moats, a seven story main keep, twenty three yagura turrets and ten gates, making the complex one of the grandest in Japan. 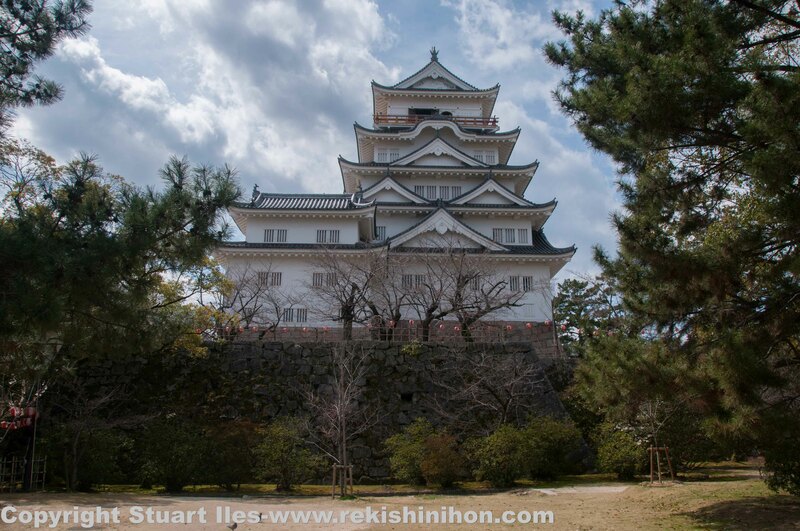 The moats were filled in during the Meiji restoration period and many of the original buildings destroyed. Other buildings that survived the Meiji period were destroyed in the second war. 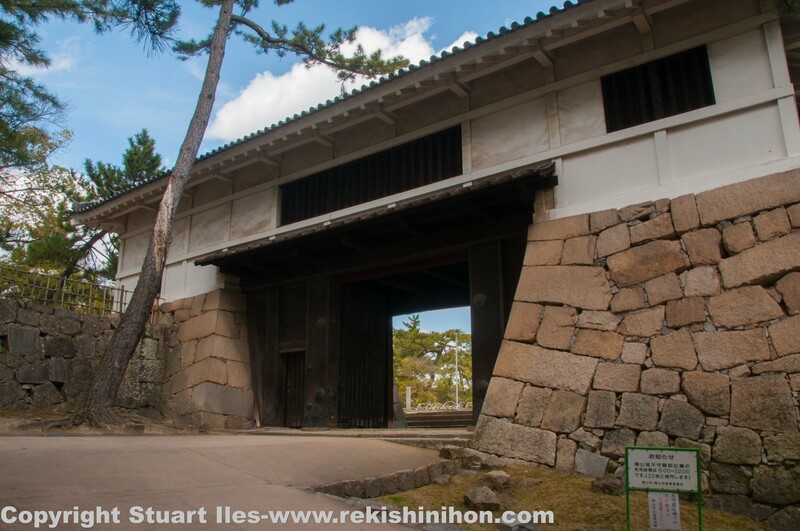 All that survives in original condition are the Fushimi yagura and Sujigane Gomon (main gate). The restorations of many of the old buildings are good and certainly recreates the feeling of what this castle once looked like. I had a great day. Original layout of the castle. The moats have disappeared and the station sits where the original outer wall would have been. 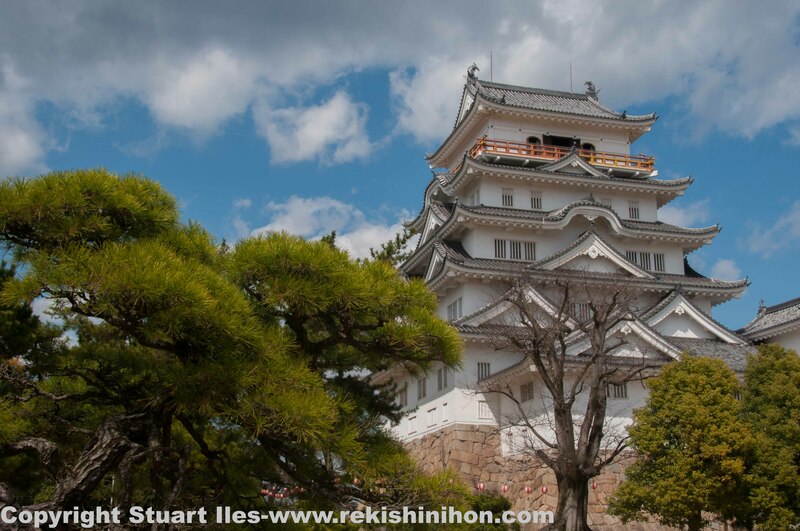 Looking at the Tsukimi yagura (left), Kagami yagura (middle) and the top of the main keep on the far right from the south eastern side of the castle. Strong, high main walls with builders markings. Looking back down the steps. Sujigane Gomon – main gate. 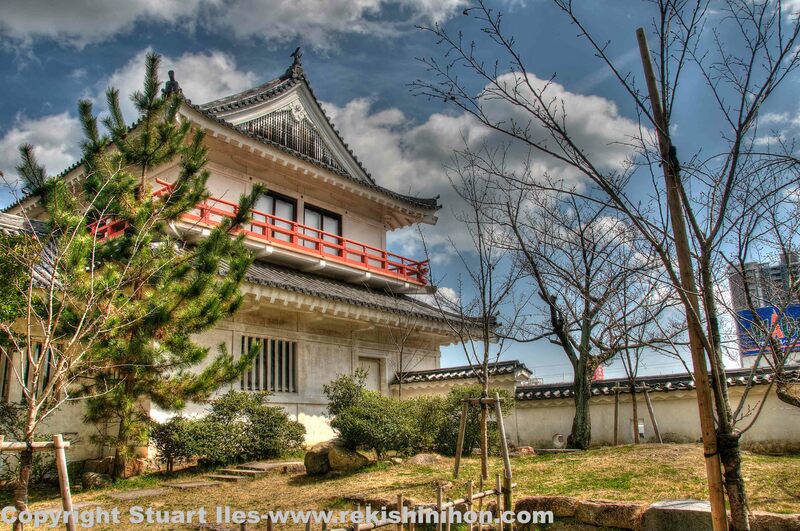 Many buildings here at Fukuyama were moved from the Fushimi castle complex. 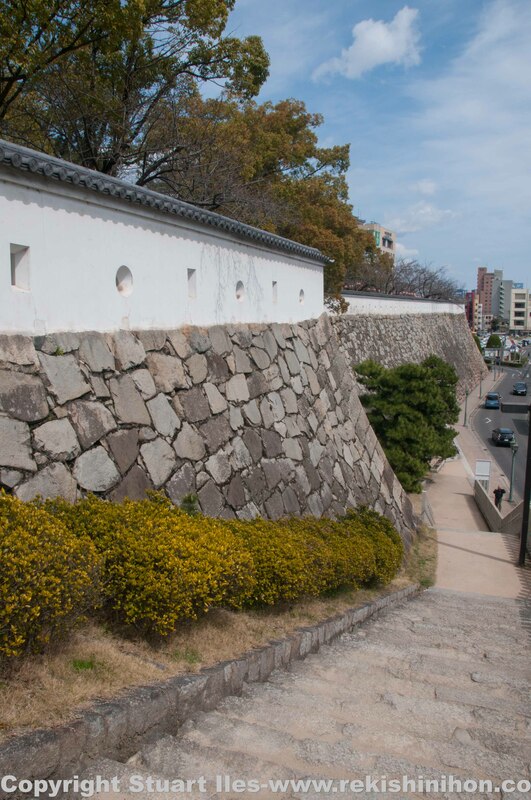 The new Tokugawa shogunate was in a rush to get a number of castles built in the western provinces to show and guard its new authority so some buildings were moved from existing castles to cut down on build time. Original location and architecture. Important cultural asset. 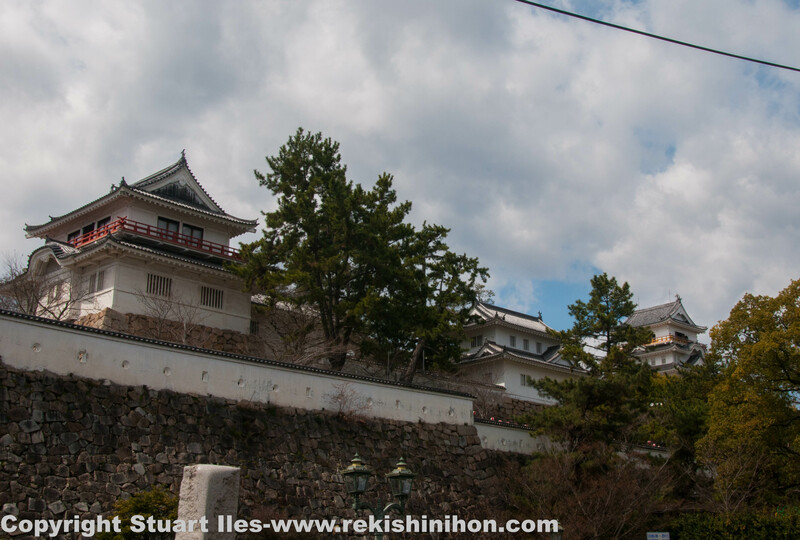 Shorou – Turret and bell tower. This was the castle’s time keeper and was used to summon citizens in times of need. 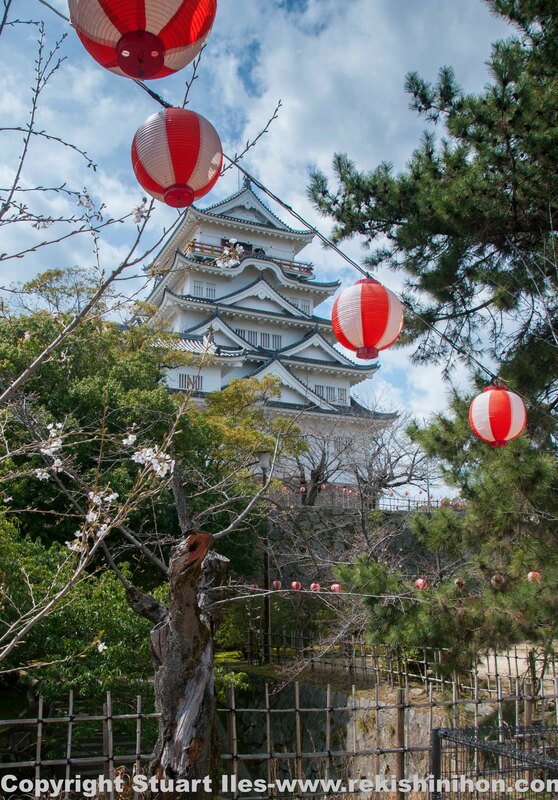 This is the only tower fitted with a bell in any castle the whole of Japan. Important cultural asset for Fukuyama city. A nice side view of the main castle from the western side. Tsukimi yagura – Moon viewing turret and watchtower. 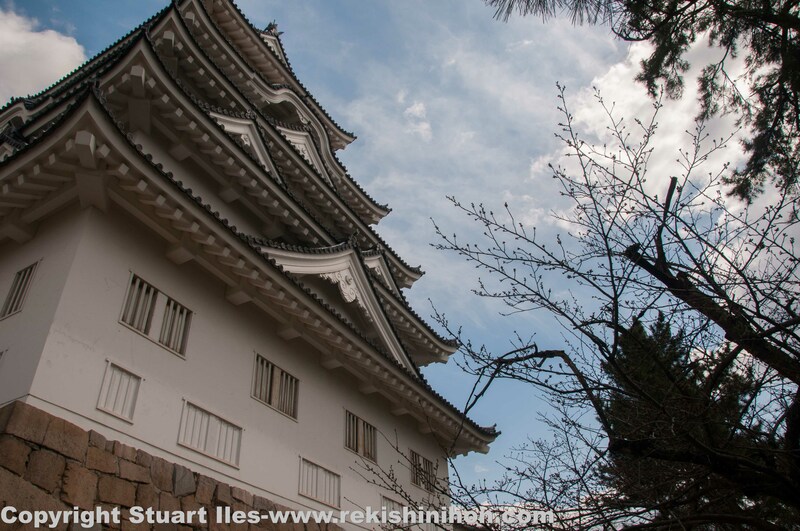 This building was also moved from Fushimi castle and rebuild here as it sits now. The original was destroyed in the 1870’s but restored to its original state. It is now used as a hall and available to rent. Yudono – the castle bathhouse now a hall to rent. This building was also moved from Fushimi and rebuilt here. Unfortunately, the original was destroyed during the war. The interior and exterior was restored in 1966. View from the top of the castle looking north. Fushimi yagura – Also brought from Fushimi castle. 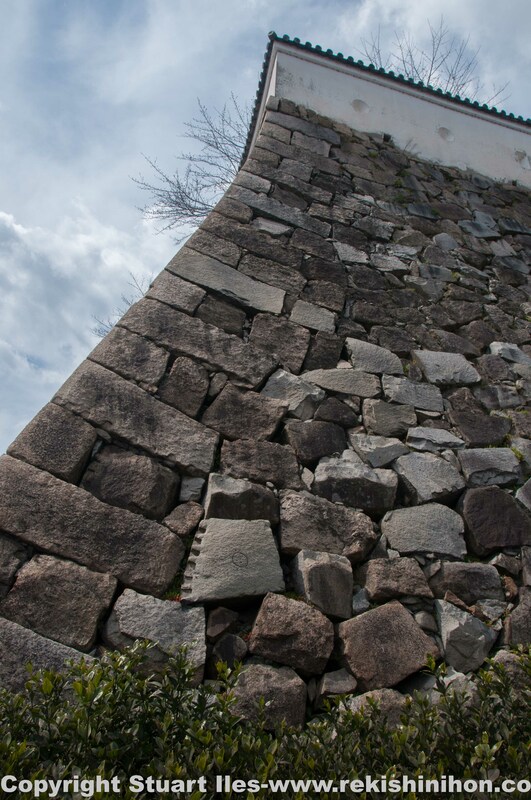 This turret is unusual because its architecture is from the Momoyama period of Japanese history which is different to the other structures of the time. Only this turret and main gate are what have survived in their original locations and structure. National important cultural asset. Main tower from the east. Main tower from the south. Designated nation treasure. Unfortunately the original main tower was destroyed during the war. 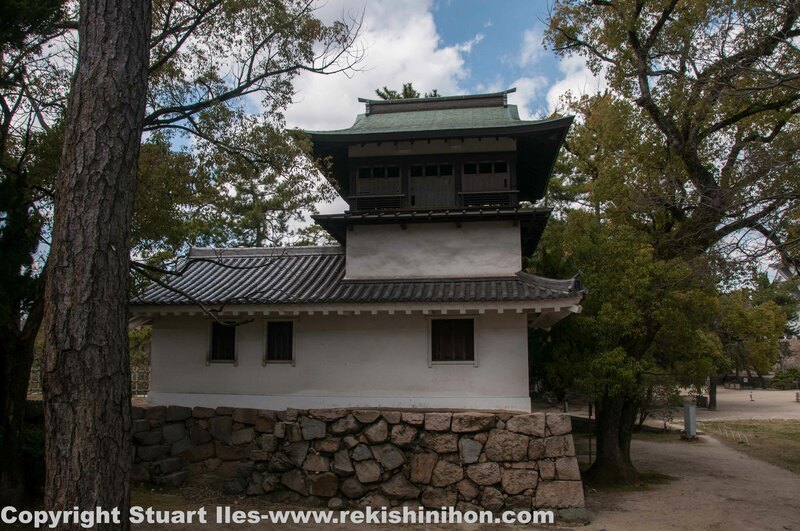 This tower was restored in 1956 from money donated from Fukuyama citizens. It has some interesting items and historical artifacts inside but isn’t as good as some other castles. No photos allowed inside and no English information. Photos and text by Stuart. Next Post Shukkeien, historical gardens in Hiroshima.